More than 25 percent of women older than 60 were obese as of 2009, according to statistics from the Centers for Disease Control and Prevention. The foods you eat at age 60 can impact your health, help you lose weight and make you feel physically stronger. As you get older, your body undergoes changes such as slowing metabolic function, cessation of menstrual cycles and loss of muscle mass. 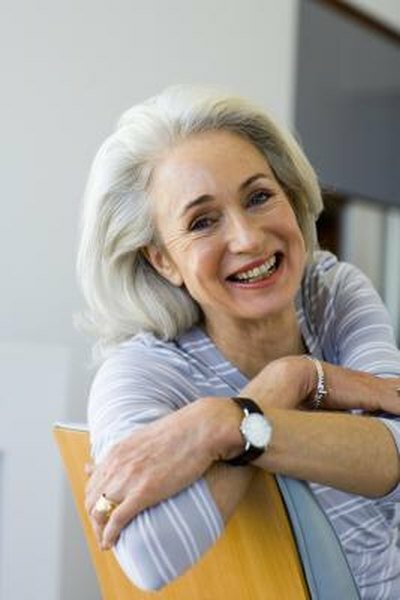 The average age of completion of menopause, according to the National Institutes of Health, is between the ages of 45 and 55. After menopause, your progesterone production drops to almost zero and your body produces significantly less estrogen. These decreases in hormones raise your risk of heart disease and high cholesterol, which means that being overweight is an even bigger health risk for a woman over 60 than it was when she was younger. Your slowing metabolism makes it necessary to adjust your caloric intake. In general, a woman between 26 and 30 years old needs between 1,800 and 2,200 calories daily, and the average 56- to 60-year-old woman needs 1,600 to 2,200 calories, depending on her activity level. If you are sedentary, meaning you do not engage in any dedicated exercise, you should eat about 1,200 calories a day. The 400-calorie decrease from 1,600 to 1,200 calories results in a 2,800-calorie deficit for one week, which translates to losing about 4/5 lb. per week. If you increase your activity level from sedentary to moderately active, you can eat about 1,300 calories a day, and becoming very active enables you to eat about 1,700 calories. Caloric needs vary by individual, as your amount of body fat and muscle may affect your weight loss rate. Building muscles in your body helps you use calories faster, which improves your metabolic rate, according to the President's Council on Fitness, Sports and Nutrition. A healthy diet for a 60-year-old woman should include foods that keep you full, yet are low in calories. A study published in the April 2011 issue of “Obesity” followed postmenopausal women who averaged between 53 and 63 years old. The women who ate a low-fat diet and got regular exercise lost significantly more weight than women who did not follow either protocol. A healthy low-fat diet might include egg white omelets, or a high-protein Greek yogurt with fresh fruit for breakfast, grilled fish or chicken for lunch and a vegetarian burger, beans or lean steak for dinner. Low-calorie side dishes for lunch and dinner include fresh or canned fruits, salads, raw or steamed vegetables, small servings of whole grains, wheat rolls and yogurt. Complete 45 minutes of exercise most days of the week. Losing weight at 60 can benefit you in the long-term, as evidenced by a study published in the April 2004 issue of the journal “Gerontologist.” The study found that people who were overweight at age 70 had a more difficult time staying mobile, had less muscular strength and experienced more difficulty taking care of themselves. If you are unable to lose weight on your own, ask your doctor to recommend a commercial weight loss program or registered dietitian who can help you individually.